australian panthers-The Herald keeps up their fine tradition of forgetting journalism and going for the quick extended gag story. First you dont ask for the document, you just relay some gossip. The online version is different to the newspaper. 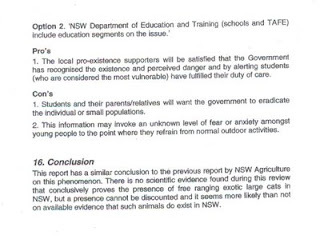 The newspaper said "While there is no scientific proof the panther does roam.."
If they had reporters who could use Google and the phone they would have found out that the NSW DPI does not accept any form of secondary evidence. Can reporters follow that simple statement.??????? Then they threw in a bigfoot gag,. "..concludes that even through scientific testing hints the panther is a figment of peoples imagination, a massive cat may well call the bush home." There is no form of scientific testing, and the DPI staff have even seen the cats. And it doesnt exist yet may exist according to the above. Literacy as well as research are not strong points at the Herald it seems. And just to cap off a story worthy of 3 minutes of "research", they decide to go for the space cadet angle. Why not avoid the people that gather information for the DPI, and go for a guy that had ZERO to do with the DPI work/findings. Sure, that makes sense for quality journalists.! So they contact Rex Gilroy who did not let them down. The Herald stated "..said he had more ufo sightings than panther sightings but was not surprised.."
If you were going to help make the whole story a joke then its always best to be asked about large cats and start to rattle on about Ufo`s. Here is the 2 pages of the "report" the article is talking about. We have it yet the Herald cannot get it..what a surprise. This article should be up for a walkley award. 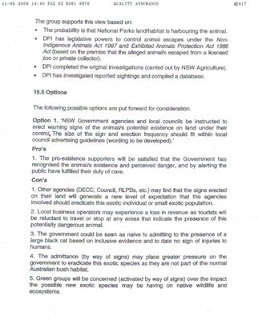 However, the Department of Primary Industries report recommends that evidence of any future sightings should still be collected.It also suggests a whole-of-government taskforce be formed should any compelling evidence emerge.However, Fairfax Community Newspapers reports the released three pages of findings is a "watered down" version. A 24-page report is said to recommend the government erect warning signs about the potential existence of the animals, or conduct education sessions at local schools. Renewed state government interest in the possible existence of the cat was sparked last year when Premier Nathan Rees said he no longer believed the reports were an urban myth. "There are too many people reporting sightings," he said last September, only weeks after becoming premier. "Of particular concern is if there are little kids out there, and there actually is one of these things. "It is easy for all of us to dismiss these things ... but if we're actually wrong then there is an altogether different set of scenarios." Mr Rees was refusing to talk about the panther's existence following the report's release today. While many people believe it is some type of exotic cat, possibly a panther, cougar or leopard, myth busters say they are nothing but large feral cats with thick winter coats.The creatures are said to roam from Penrith to the Hawkesbury region in Sydney's north-west, along the Nepean River and across the Blue Mountains to Lithgow.